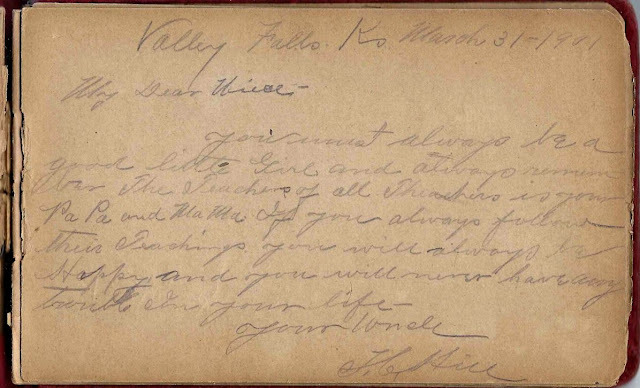 Heirlooms Reunited: 1900s Autograph Album of Carthagenia Hannah McCormick of Wamego, Kansas. 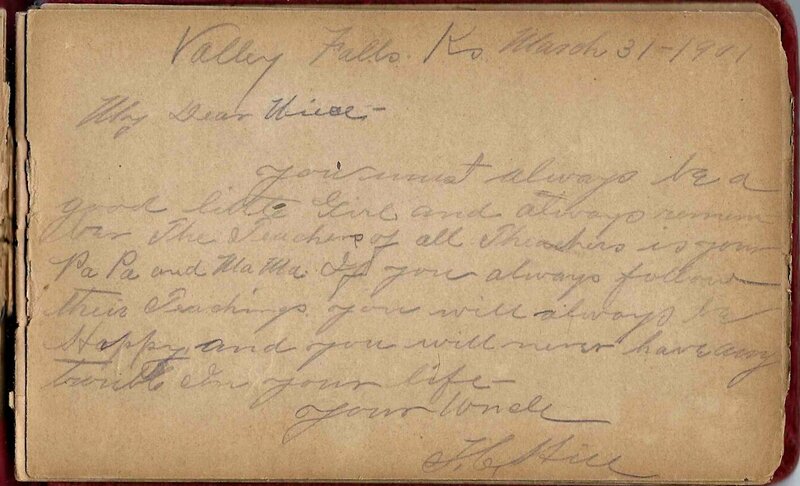 1900s Autograph Album of Carthagenia Hannah McCormick of Wamego, Kansas. 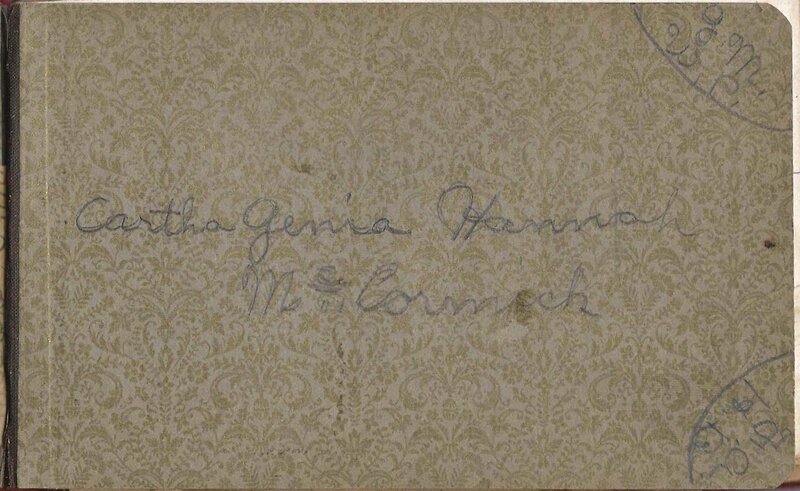 1900s autograph album of Carthagenia Hannah McCormick, "Genia" of Wamego, Kansas. 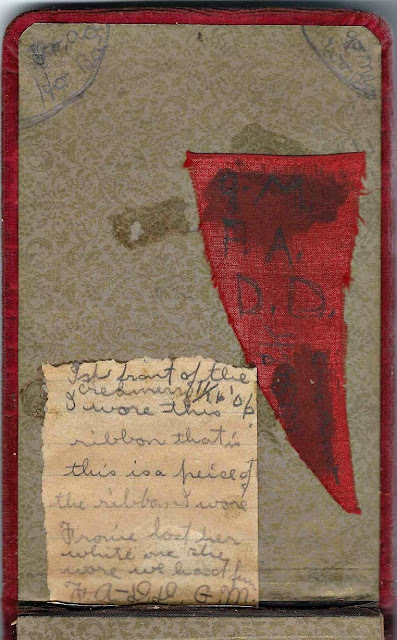 Many of the pages are inscribed to "Sweet Heart" or "Sweetheart", even by teachers, so it wasn't just a nickname within Genia's family or circle of friends. The album is approximately 6-3/4" x 4-1/4" with puffy velvet covers and contains the sentiments of over 70 people, some of whom signed more than one page. Many people signed pages that had already been signed by others at a different point in time. Genia pasted part of a sash on the inside front cover and wrote her name on the title page. 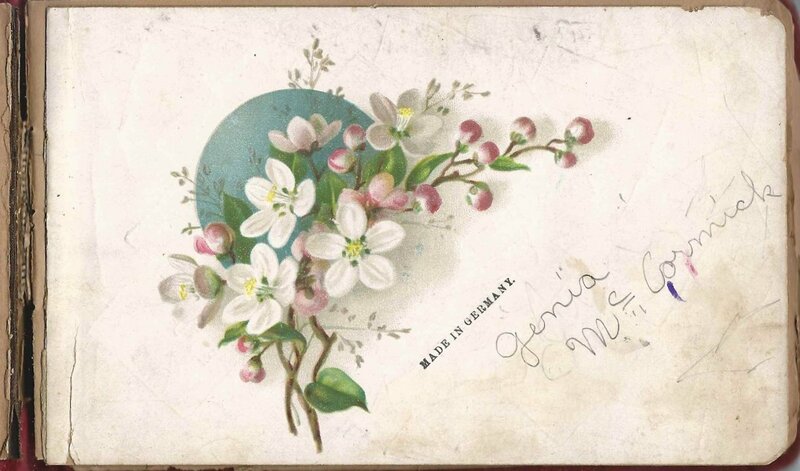 Genia tucked her calling card into the album. Carthagenia Hannah McCormick, was born 2 December 1892 at Kansas City, Kansas, the daughter of James F. McCormick and Carthagenia (Hill) McCormick. A James F. McCormick signed a page in Genia's album but didn't identify himself as her father. 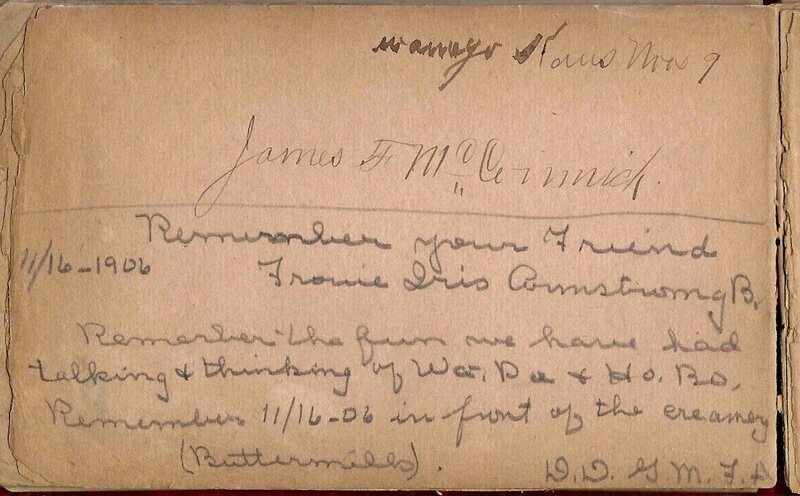 Genia's brother James Telford McCormick signed a page at Wamego, Kansas on 8 November 1902. I'm not sure of the names of Genia's paternal grandparents, but one of her father's brothers was John McCormick, who also raised a family in the area. 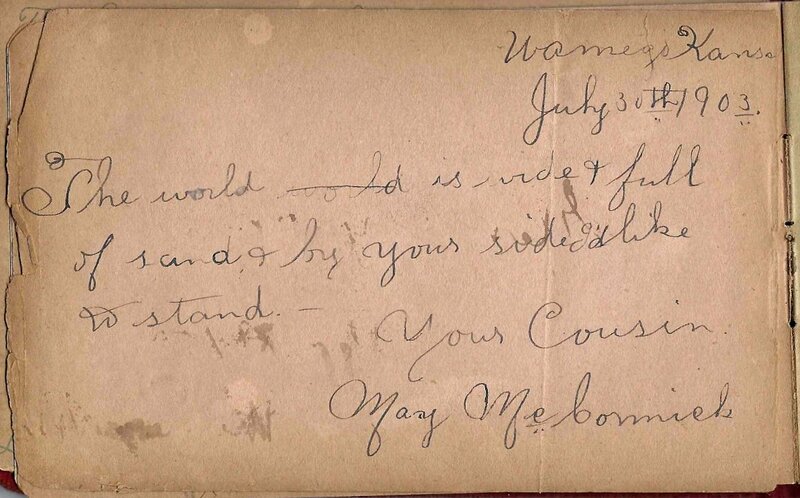 John's daughter May McCormick inscribed a page to her cousin Genia at Wamego, Kansas on 30 July 1903. 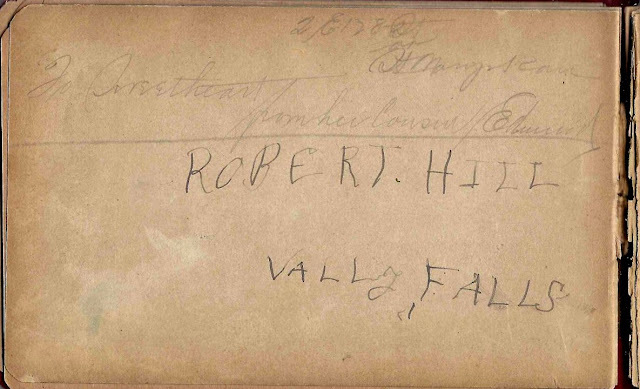 Genia's maternal grandparents were John Anderson Hill and Hannah (Howell) Hill. 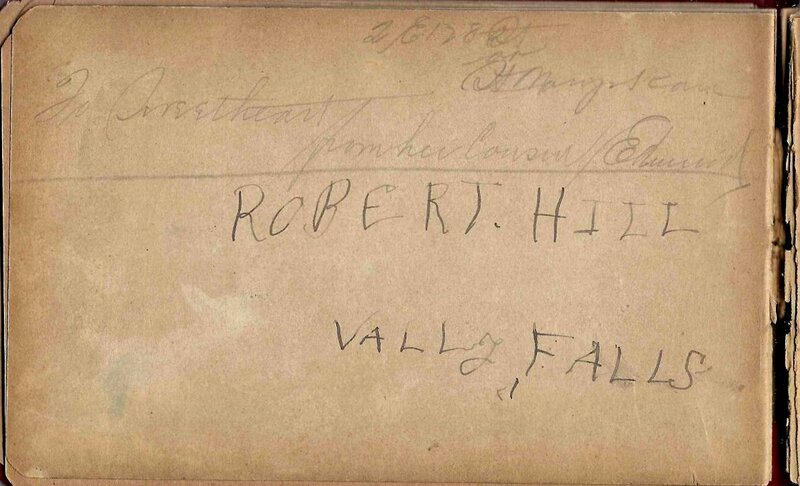 Another cousin, Edward, who didn't sign his last name, signed a page at St. Marys, Kansas. One page in the album was signed by one if not two of Genia's teachers. 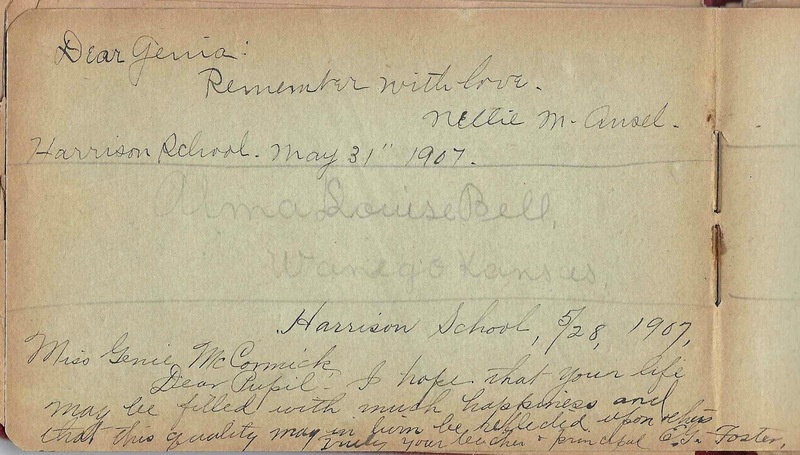 Nellie M. Ansel signed at the Harrison School on 31 May 1907. Alma Louise Bell signed at Wamego, Kansas. 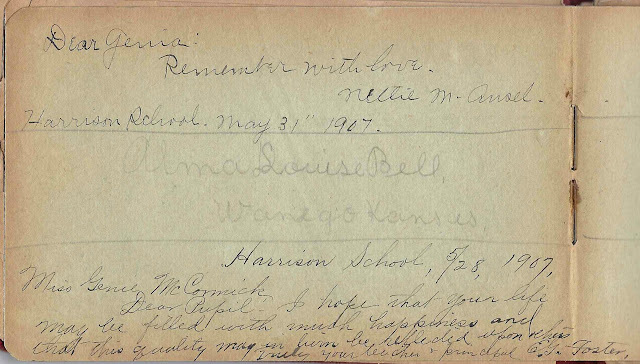 E. G. Foster, Harrison School teacher and principal, signed 28 May 1907. 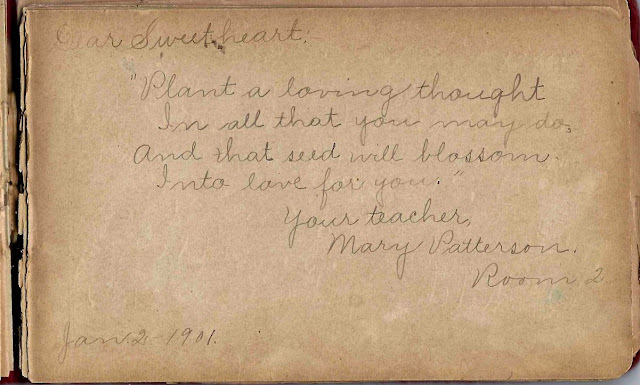 Teacher Mary Patterson signed a page on 2 January 1901. Genia married George Albert Greider, son of, I think, William H. and Emily Greider. 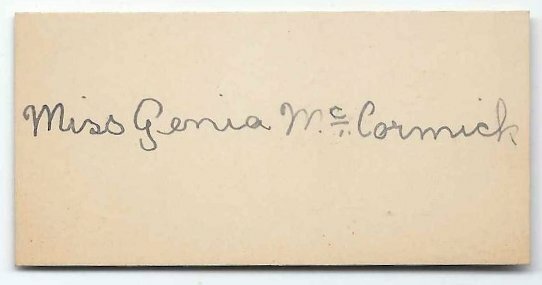 Genia and George received a marriage license in January 1920, but I don't know the date of their marriage. They were living at Topeka, Kansas in 1925, with two young children, according to a Kansas State Census. By the time of the 1930 Federal Census, they were living at Tulsa, Oklahoma, where George was the proprietor of a tire and battery store. 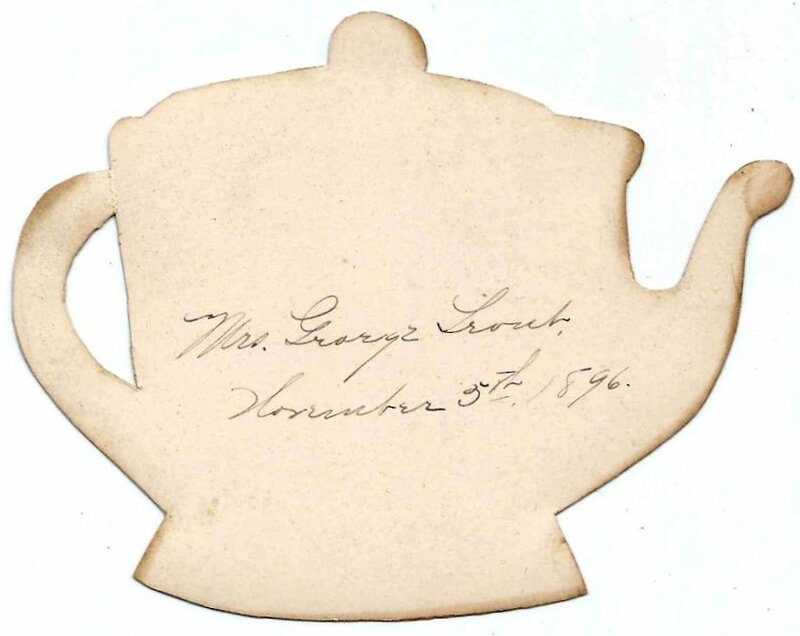 Another item tucked into the album was a teakettle shaped invitation to the home of Mrs. George Trout for a spot of sewing and tea on 5 November 1896. 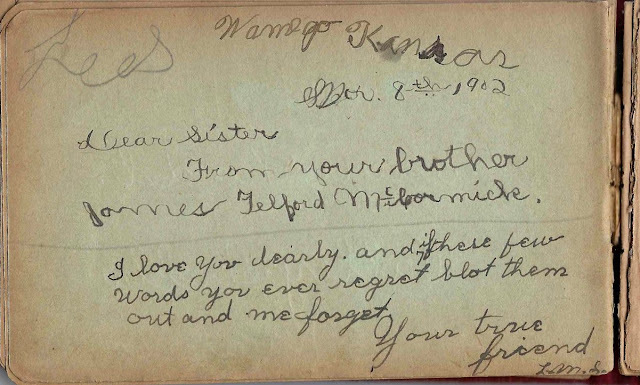 Name looks like Luceyl F., signed at Wamego, Kansas. Not sure of surname initial. Written in a young hand. Rachel Boyd, signed at Wamego, Kansas on 27 December 1900, to "Sweet hart"
Gertrude L. Childers, signed 24 September 1901; possibly Genia's teacher. 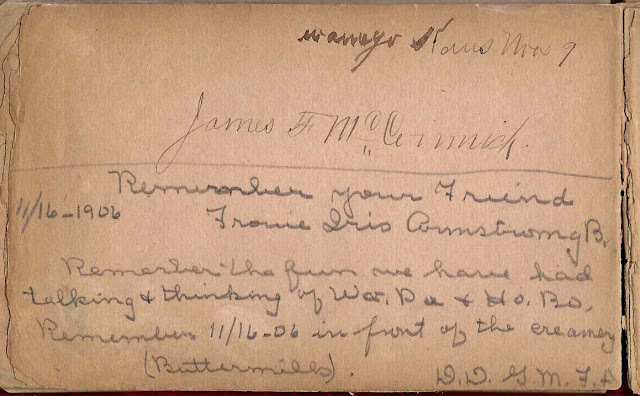 Also signing that page, not necessarily known to each other or signed at the same time: M. S.
John Hill of Valley Falls, Kansas, "your little friend"
James Telford McCormick, Genia's brother, signed at Wamego, Kansas, on 8 November 1902; also signing that page, not necessarily known to each other or signed at the same time: L. M. S.
Mary Patterson, Room 2, signed on 2 January 1901; Genia's teacher. 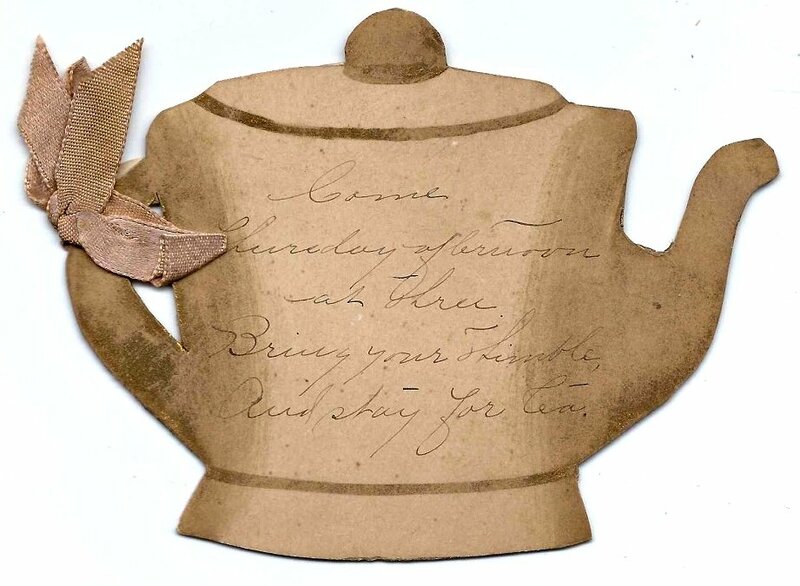 Inscribed "Dear Sweetheart"
Mrs. George Trout created teakettle shaped invitations for sewing and tea at her house on 5 November 1896. 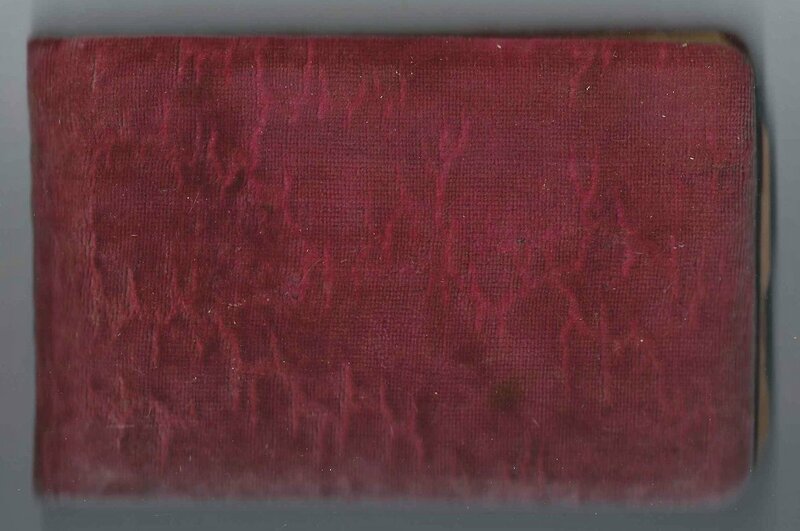 One of the invitations was tucked into the album. Mazie Weekly, signed 18 November 1906; also signing that page, not necessarily known to each other or signed at the same time: Leo Nancy Croff. Mazie signed another page as well.